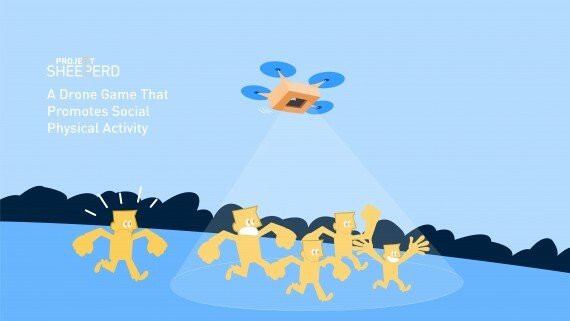 ‘Project Sheeperd’ is a social game concept that promotes physical activity, using consumer-grade drones. Players, who wear a headset, are competing against each other to be the last player standing inside a light circle, which a drone projects to the ground. Why did we design it? The obesity is becoming a widespread disease internationally because of the many reasons. The solutions for obesity that incorporate physical activity lack of engagement and not playful to sustain the behavior change. These solutions are also often very prescriptive and need high user motivation and commitment to make a change. Parallel to this, the dropout rates of the existing technology-based solutions to promote physical activity is very high. Project Sheeperd offers a familiar solution this problem by rethinking the outdoor gaming with the help of using technology to increase the engagement while promoting the physical activity. Inspired by other social physical games such as laser-tag and paintball, it aims to change such behavior through gamification. Before starting to play, each user wears a cap whose circuitry senses projected light from the drone and determines players status, and calibrate their cap to set environment normals. When a player steps outside of the circle, the cap sends feedback to the player by the vibration, produced by a small size vibration motor to inform that the player loses points. If the player cannot stay in the circle for a total of 15 seconds then the player is eliminated from the game. By being an example of open by design, it aims to be easily replicable by both existing drone users and users, who are interested in building their own drones. Enthusiasts, who are interested in building their own Project Sheeperd’s can obtain all equipment from widely available electronic parts stores. The specifications and all source code are accessible through the internet. Both its physical and interaction design is intentionally not perfected to act as an invitation to tinkering and improving. Although every user can replicate the setup in its current state that we believe that the game can be improved to be more sophisticated or automated by incorporating more sensor technologies such as camera tracking, better game dynamics, or adding levels of difficulty to the game structure. We have tested our proof-of-concept demo with participants who have been suffering obesity as well as who haven’t been suffering any major disease. Both users group seem to enjoy the gameplay and well understood the game concept. Majority of groups that played the game played it multiple rounds, with an average of three sessions. Some of our users suggested having a more sophisticated game structure to increase the long-term engagement of the game.